The first and most important thing you can do for your garden is to start with a soil test. I test my soil with a at home kit every spring. Your soil nutrients can change from year to year. I prefer to just use an at home soil test but you can also get a soil sample and send it to a lab or your local extension agent. To get an accurate soil test you will need to take 8-12 soil samples with a shovel digging from a range of one inch to twelve inches deep. Making sure each soil sample is in a different area of your garden. Dump these samples into a bucket and mix. Some helpful tips to remember when taking a soil sample. Follow the test lab or at home test kit instructions. Take samples before working the soil. Use a clean shovel or trowel and wear clean gloves so you do not contaminate the test results. Soil samples should not be to wet or to dry. When using the at home soil test use distilled water. Do not take any soil samples if you have fertilized, wait for about 2 weeks. The results are in! What do you do with them now? At home soil tests give the values of your soil nutrients for your pH, nitrogen, potassium, phosphorus, calcium, and magnesium. Low on N: Yellowish and light green foliage, stunted growth. Sources for N: bonemeal, fish, chicken, and steer manure. Low on P: Leaves look dark green or have a reddish purple tint to them. Low on K: small fruits, older leave may wilt or look scorched on the tips. Low on Ca: Leaves on the top of the plant are distorted, also causes blossom rot. Low on Mg: Older leaves turn yellow on their edges, yield can be down. Y’all are itching to get out in the garden aren’t you?? If your anything like us you till have 6 inches of crusty snow on the ground or it is muddy! Sooooo not going to happen for awhile. A girl can dream right? Well I’ve been dreaming about my garden and where I am going to plant all my lovely vegetables! Did you know that some vegetables love each other and some just darn right can’t stand to be together! Who knew vegetables and flowers were so picky! Vegetables also like to be planted in different spots every year. Remember to rotate your vegetables and never have them growing in the same spot twice. I’m on a 3 year rotation. So while you are itching to get in the garden lets do some garden planning first! I would hate to have my garden not getting along. Friends: Tomatoes, parsley, basil, & nasturtiums. Friends: Beets, corn, cabbage, carrot, cauliflower, celery, cucumber, eggplant, leek, parsnips, pea, potato, swiss chard, radish, rosemary, summer savoy, strawberry, & sunflower. Foes: Onion family, beets, cabbage, fennel, kohlrabi, radish, & sunflower. Friends: Aromatic herbs, beet, bush bean, carrot, celery, cucumber, kale, lettuce, nasturtium, onion family, potato, rosemary, swiss chard, spinach, & tomato. Friends: Bean, brussel sprout, cabbage, chive, lettuce, leek, onion, pea, pepper, radish, sage, rosemary, & tomato. So before you start planting your garden this spring ask yourself are they friends? or foes? Well you’ve harvested your garlic. Now what? If you want to enjoy your garlic right away, you can eat it straight from the garden. To enjoy these tasty bulbs all year long curing your garlic is a must! 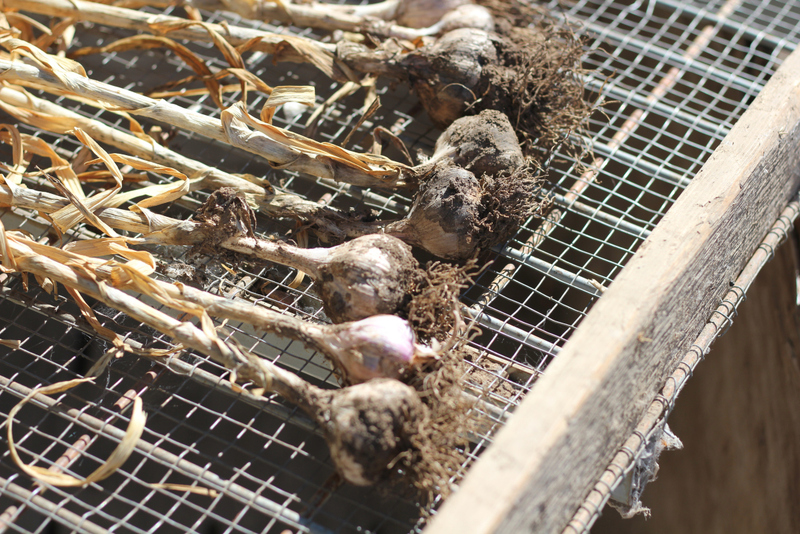 Once harvested take garlic bulbs to a shady, dry area. Best spots are a covered porch, breezy shed or garage. It is very important to keep your garlic out of the sun, garlic bulbs are easily sun burned. No need to clean, trim roots or foliage. Garlic stores longer with its stalk and leaves attached. Lay the bulbs in single layers on screens, drying racks, or slatted shelves to promote good air circulation. Some gardeners tie the stalks in loose bundles of 8-12 plants and hang them under cover. If you have a softneck variety you can even braid the stalks. The plants should dry for 3-8 weeks, depending on the humidity and amount of air circulation. Most growers use a fan in the curing process. Once garlic is cured for 1-2 months, your garlic leaves should be completely brown and roots should feel stiff and dry. To clean your bulbs trim the roots, then cut the stalks off ½ inch above the bulb and gently clean the bulbs with a soft bristle brush, taking care not to strip off the papery skin. If the internal leaves are still green and moist stoop cleaning and let dry longer. For storage, hang your bulbs in netted sacks with good air circulation on all sides. Perfect storage conditions are 45-55 degrees Fahrenheit at 50% relative humidity. Storage below 40 degrees actually makes garlic sprout faster. Following these steps should make your garlic last till winter. Unless your like my family and eat it all before winter comes around! Why choose Irish Eyes Garden Seeds? We are dedicated to promoting sustainable, organic, and lifelong farming practices. We specialize in short season seeds for an early harvest. We are strongly against GMO’s in all forms and we support and promote organic farming and gardening practices. Each year we donate our left over seeds to many non-profit organizations around the United States and the world. We offer over 200 different open-pollinated and heirloom seeds. We are members of the Organic Seed Alliance, the Safe Seed Pledge, and FFA/4-H.
By recycling, creating, and reusing our own compost, we have reduced our farm waste tremendously. Last but not least we care about you! We are here to educate our gardener and turn more brown thumbs to green!! Alexa, Greg & Sara standing in a field in Peru.